Unique keepsake for your bridesmaids, maid of honor or matron of honor to commemorate your wedding day. Personalized with names and wedding date. Share what's in your heart with your dearest friend on your wedding day! This wonderful Thank You Gift is the perfect way to remember your bridal attendants. 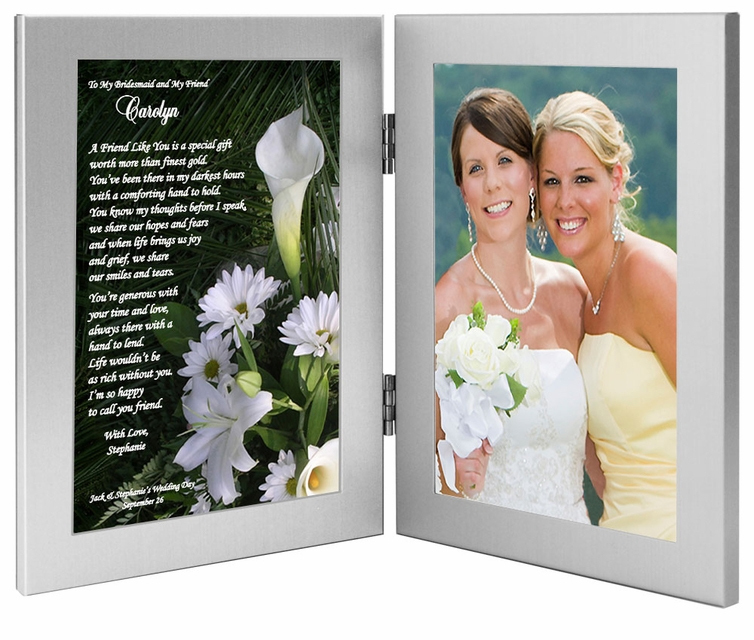 It can be personalized for a bridesmaid, maid of honor or matron of honor. The poem let's your bridal attendant know how much you value her friendship. When a photo of the two of you is put in the gift frame, it truly becomes a personal keepsake and a beautiful "thank you" present. 1. Optional Phrase Above Name (optional) - Examples: To My Friend & Maid of Honor; To My Bridesmaid; etc. 3. Closing Phrase and Your Name (optional) - Examples: Love, Lindsey; Thanks for Everything, Lindsey; etc. Life wouldn’t be as rich without you. I’m so happy to call you friend.